AS WE PREPARE TO PHOTOSHOOT OUR DESIGN PROJECTS, STYLING AND STAGING EVERY ELEMENT IN THE FRAME BECOMES CRITICAL. FOR SHOOT DAY, WE BRING IN EVERYTHING WE FEEL WILL MAKE THE ROOM PICTURE READY. IN THIS SECTION, I TALK ABOUT THE DETAILS OF STYLING AND STAGING. This daybed is layered with so many complimenting colors, textures, fabrics, prints and solids to create an overall inviting bed. There is the soft muslin quilted bedspread flanked by grey linen throw pillows with a pom pom detail, the emerald velvet cushion with a linen back, the silver velvet pillow - and they all meet with the faux fur emerald pillows. Also accented in the middle is a antique silver paisley printed turquoise velvet pillow with silver pom poms. Note how there are similarities between the colors, pom poms, linen, velvet over so many different design elements. The moon crater metal art is hand finished with imperfections while painting the wall a darker color makes it a feature. The soft details are all about interior design and styling! I loved designing and styling this nursery. I added a blush knitted blanket on one side of the crib to create some weight in an otherwise very ligth and fluffy room. The dress in front hangs on a pink velvet haner with rose gold metal. I could have picked a pink dress (which every mom has for her baby girl) but instead I chose this floral green dress with a smoking neck to break the color a bit. I love the symmetry of this picture and the styling enhances it a few notches. Detailed styling shot of this master bedroom. There are so many interconnected details in this shot. The nail head trim on the nightstand, nail head trim on the bed and the silver frame. The blue from the bedding interacts with the blue books, artwork and blue jewelry in the display box. The black leather and the white bedding create an accent. Shelfie styling here... Inspired by the rainbow artwork made by the little girl, I arranged her board games, the pens in her caddy and the beads in her bead carousel in rainbow colors and gave central space to the rainbow heart book at the top. Pigs, bunnies and elephants are the soft animals I used. The yellow metal pen holder and the yellow metal house tealight are jumping off points. I decided to style this dining room minimally.... I chose to do a fruit bowl for this photoshoot instead of a full table setting to highlight the design more than highlight styling. The green artwork grounds and warms up this very minimal and modern dining room. By adding the fresh fruit in the brass bowl, I managed to create freshness. The brass in the bowl and the brass in the art coordinate with each other. The turquoise decor pieces in the background breakup the white a bit while creating symmetry and height. This entry foyer is perfection. The orchid in the middle of the mirror flanked by the pendant lights creates a playful organic symmetry. The white base breaks the darkness of the console table and adds a welcome contrast. This master bedroom bed is the central part of the room. 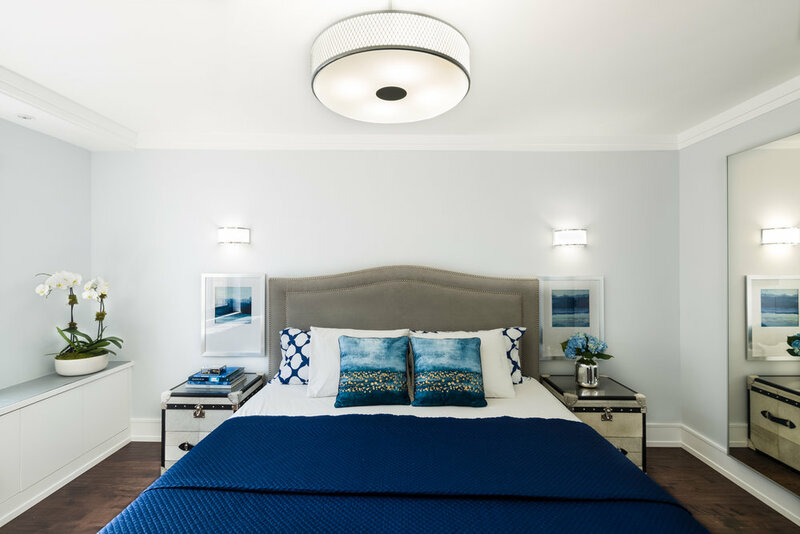 We created a neutral room with grey walls and white ceiling and a grey velvet headboard. Once we had our neutral palette, we added color with the bedding, art work, flowers and books. The deep blue coverlet folded half way lets the white sheeting pop. There is design detail in the pillow arrangement as well. I did king sized pillows in blue print, then standard pillows in crisp white and then square cushions in the middle. The artwork has an asymmetrical blue with more white at the bottom. These are all details that are thought through and specified. The wooden cutting board is styled to add color to the neutral kitchen while adding a natural warmth with the wood and the fruit. I kept the mango towards the edge so it is close to the yellow bar stools. The exposed spine of the mango core adds a subtle natural texture, which is one of my favourite details in this pic. Styling these open shelves, I had a problem of plenty. The homeowner had these lovely grey and yellow bowl which I placed in the middle shelf to bring out the yellow from the stool. The fresh herbs from her home garden add freshness in an indoor New York kitchen, while the jars with the colorful lids and chalkboard labels are playful and enhance the black window frame. 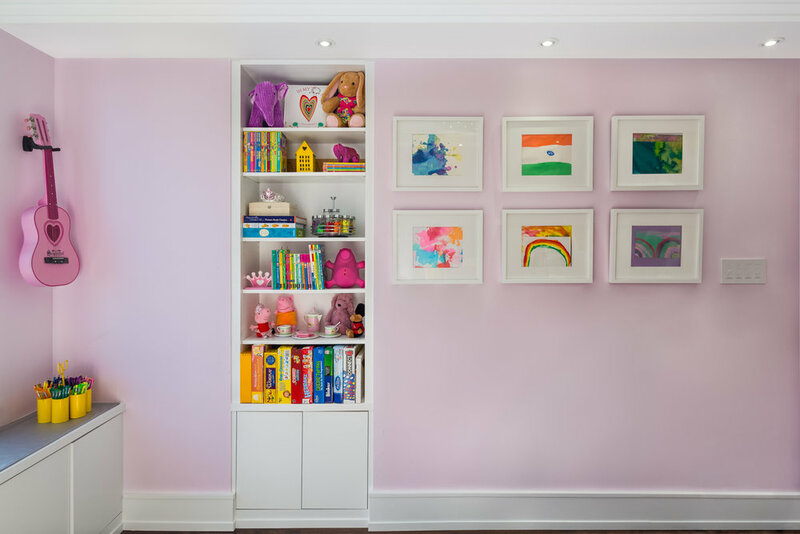 One of DesignbyRUCHI's favourite projects. We took a U-shaped kitchen, stuck in the 70's with wallpaper, laminate countertops, functional challenges 'et al and redesigned it into a modern, functional, beautiful galley kitchen with an eat in bar. We designed custom cabinets and created plenty of storage for the homeowners. 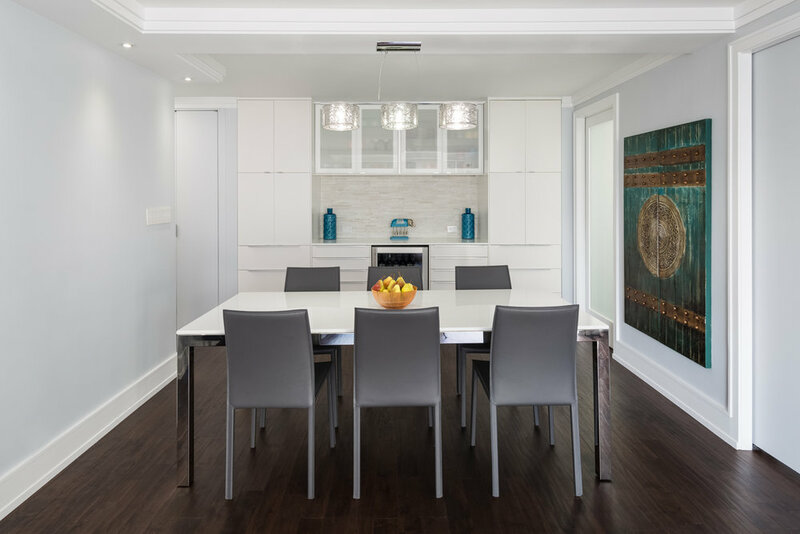 We selected the overall color palette, materials, best deals on high-end custom paneled appliances that make this kitchen light and bright and airy for the family to enjoy. Photography by Andrii Zhulidov. We redesigned a U-shaped kitchen into a galley kitchen to create an eat-in breakfast bar and to maximize storage, function and workflow. Design features includes custom shaker cabinets with a step detail, floor and backsplash tile laid out in timeless herringbone pattern, appliances with custom panels and the pop of yellow bar stools. They always make the little girl smile who has her breakfast there looking out the window at the sun. Eat-in breakfast bar overlooking the beautiful view out the window. 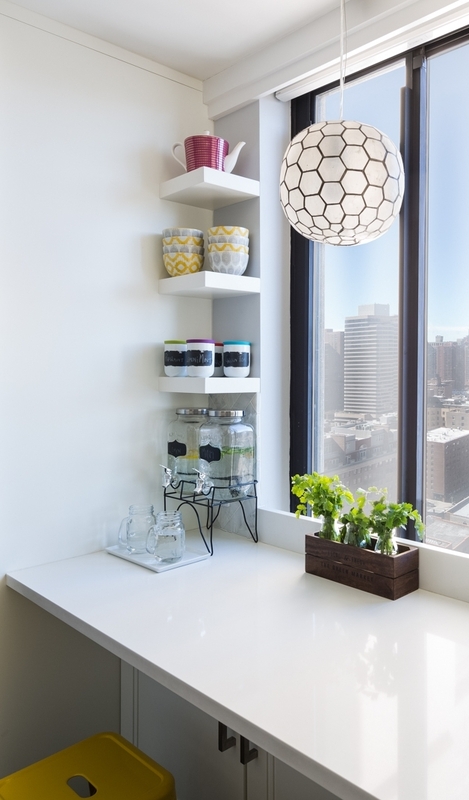 Custom open shelves create a rotating gallery of cookware with changing seasons and use. Extra tip - there are shallow depth cabinets under the bar for additional storage and still enough leg room to comfortably sit. Classic Tolix bar stools in yellow add an industrial feel and a pop of brightness. They are metal and hence an easy wipe clean for a family with little ones and their infinite playdates.